Ottawa – ­U.S. President Donald Trump has announced that the North American Free Trade Agreement (NAFTA) will be now called the “U.S.–Mexico Trade Agreement” after shutting Canada out of negotiations for weeks. The Council of Canadians is concerned that this is a sign of an America-first, corporate-friendly deal to come. Changing the name to the United States-Mexico Trade Agreement will not change that. The Council of Canadians has spoken out about NAFTA’s impacts on workers, the environment and public interest since the deal was signed. 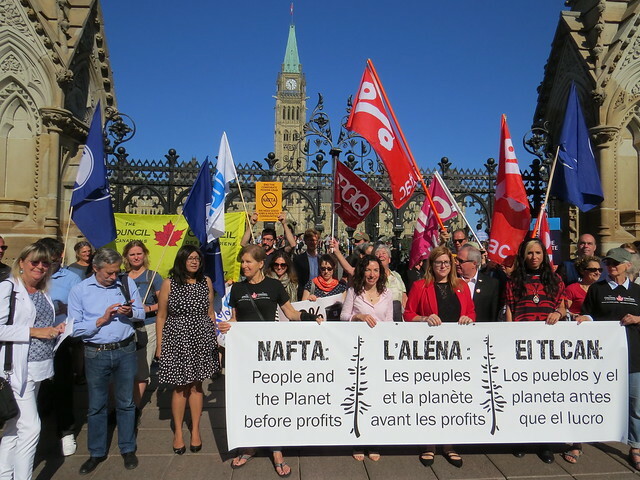 Recently, the Council of Canadians has published a several reports on NAFTA: Getting it Right: A people’s guide to NAFTA, NAFTA 2.0: For People Or Polluters? (with the Sierra Club U.S and Greenpeace Mexico) and Escaping Mandatory Oil Exports. For more information, or to arrange an interview, contact Sujata Dey at sdey@canadians.org or 613-796-7724. Established in 1985, the Council of Canadians is Canada’s largest citizen advocacy group with 100,000 supporters and a network of more than 60 volunteer chapters across the country. The Council of Canadians connects people coast-to-coast-to-coast who are committed to holding governments and industry accountable to social justice and the public interest. We believe a better Canada and fairer world are possible. Together, we turn that belief into action.